I have often thought to conduct interviews in Japan, but a few times the language was a barrier to entry. This is a real first interview in Japan (Tokyo) with the indispensable help of The Skinny Bib, probably one of the best “food bloggers, reviewers and/or foodies travelers” in the world. And when I say “Food blogger”, I imply: cooking enthusiast, rigorous, intellectually honest and trying to take photos where the image quality is equal to the quality of dishes. So I had the chance to discuss with one of the best young chefs of the moment: Zaiyu Hasegawa (Jimbocho Den). Chef Hasegawa was born in Tokyo in 1978. His mother was a geisha who entertained customers in a “ryotei” (traditional high-end Japanese restaurant). Zaiyu became interested in Japanese cooking under his mother’s work and influence. After the high school, he started working at a well-known “ryotei” called Uotoku. It is a few years later, at the young age of 29 he opened a small “unconventional” restaurant called DEN, and since Den has received several accolades (Michelin stars, Tabelog Japan etc.). 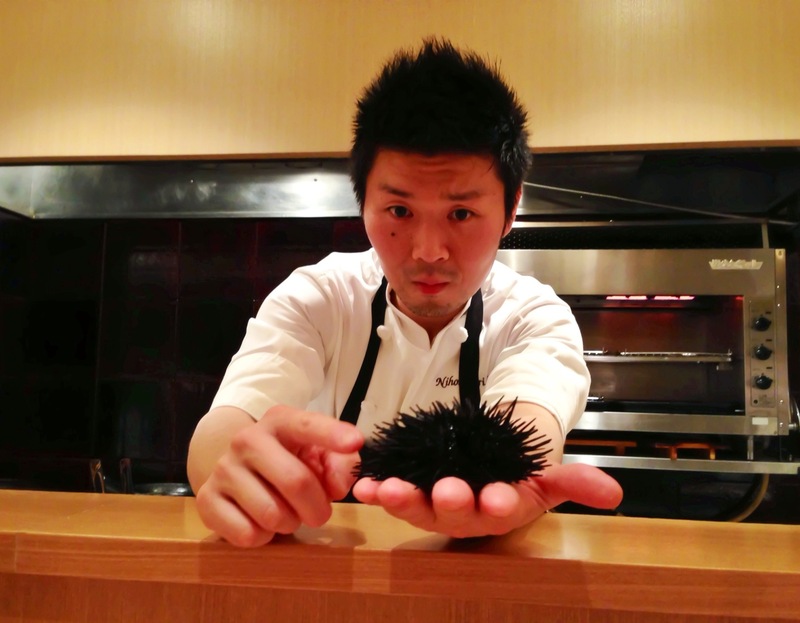 Given the hierarchy in Japanese cuisine, it is rare to see a young chef in their thirties already obtain such praise. An “Électron libre” in Tokyo dedicated to creativity, products and customer happiness! 1-(Scoffier) What is the philosophy behind your “cuisine” in general? ZHasegawa– To make people happy and express myself. 2-(Scoffier) Do you have a flavour or taste from your childhood that is again memorable? geisha, she sometimes brought home bento (Japanese lunch box). I like both. 3-(Scoffier) Do you have a particular foods (or products) that you often use in your recipes? 4-(Scoffier) Do you have a mentor (chefs or anybody else) that inspires you in your career? ZHasegawa- Everybody that I meet. 5-(Scoffier) What are your source(s) of inspiration to create a recipe? ZHasegawa– Inspiration comes from my customers, producers and staff, and how to make them all smile. 6-(Scoffier) In everything I have read and seen on you, each dish seems to experience, there is a playful side. This is important for you? ZHasegawa– Playfulness is a very important thing for me, partly because I only speak Japanese. I want my food to communicate. I always try to talk to customers through my dishes. 7-(Scoffier) Did you change your “kaiseki” menu often? ZHasegawa– My menu changes all the time according to seasons and availability. 8-(Scoffier) The restaurant is perceived by some Westerner (foodies, journalists) as one of the best in Tokyo now. How is it perceived in Tokyo (by the journalists, foodies etc.)? According Skinny Bib– “Jimbocho Den is one of the most well-received restaurants in Japan. Currently, apart from its two Michelin stars, it is ranked as third-best restaurant in Tokyo on Japan’s restaurant ranking website Tabelog. Chef Hasegawa’s cooking and hospitality is also creating buzzes overseas, most reputedly in Brazil”. 9-(Scoffier) Can you give us a detailed recipe (Signature dish or other) that is characterized the cuisine of Den and Zaiyu Hasegawa? 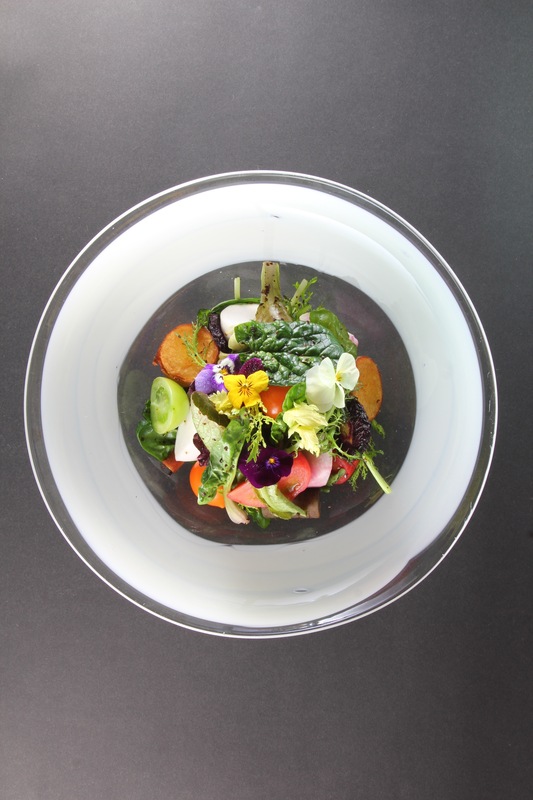 ZHasegawa– Recipe: “Salad” is my signature dish. 10-(Scoffier) What are your goals (ambitions) as chef or for your restaurant ? ZHasegawa– I hope everybody will come to my restaurant. I use a few cooking techniques for each component that goes into my salad. Some leaves are served fresh and raw; some pickled; deep-fried; braised in stock; roasted; grilled. Each component has different texture and temperature. The ingredients vary according to seasons and come from a special grower. I often dust root vegetables with tea. Sometimes I add fruit. The dressing is made by cutting kombu into small pieces and mixing them with sesame oil. © Credits for photos at: #1– Portrait by The Skinny Bib/ #2– “Salad” by Jimbocho Den.